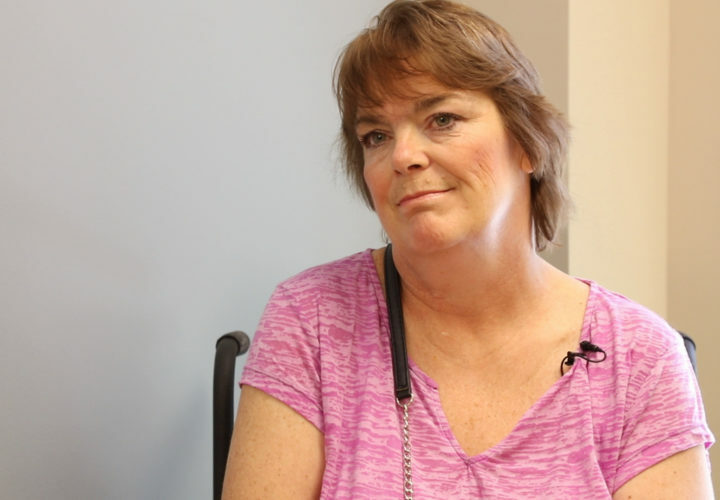 In March 2015 Shelly Christopherson suffered a spinal stroke and ruptured a disc in her C5-6 vertebrae which left her paralyzed from the waist down. To recover, she had to find a strength and perseverance she didn’t know she possessed. Relearning skills and staying positive and focused throughout her three inpatient months at Craig was incredibly challenging for Shelly. She was determined to get back to something that gave her purpose—getting back to the office. She has always been an equal partner in her family finances and she knew that if she did not get back to work, her family would face financial challenges, perhaps even bankruptcy. One morning at Craig, Shelly was reviewing her rehab schedule and saw that time was blocked off for Community Reintegration. She thought to herself, “what is this?” and almost canceled the appointment. Little did she know that Community Reintegration would be one of the most beneficial and life-enhancing programs that she would participate in during her time at Craig – and beyond! At her first appointment, Kelly, her Community Reintegration Specialist, took the time to get to know Shelly and learn what was important to her in her recovery. Shelly told Kelly that getting back to work was at the top of her list. I realized I couldn’t just roll back into work as I had expected. I needed my Community Reintegration counselor's guidance and expertise in order to be successful in my transition. Kelly became her champion and ally. She connected Shelly to the right people to ensure she would be successful once she left Craig. She helped Shelly access adaptive equipment for her truck, performed assessments of her workplace, and coached her through the physical and emotional challenges in returning to the community. Kelly, along with two other Craig staff, met with the human resources department at Shelly's office to determine what reasonable accommodations needed to be made in order for her to excel in her job. Craig is one of only a few rehabilitation hospitals that offers a program like Community Reintegration. This valuable program is rarely covered by insurance and relies on donations to serve patients like me. Community Reintegration is not one size fits all. Last year alone, Community Reintegration served the unique needs of 247 people with spinal cord or brain injury. This includes career and education exploration, coaching, the latest assistive technology and employer education. They assess an individual’s capacity to return to work and/or school and even facilitate workstations across the hospital to evaluate mobility, task completion, problem-solving and more following an injury. Finally, the team will help patients navigate the complex system of government assistance programs for people with disabilities. In order to continue to offer Community Reintegration and empower patients towards independence, Craig needs your generosity. Will you support Craig with a donation to Community Reintegration today?